Hiring a professional painting contractor is easier than most people believe. Many horror stories have been told about painters and their lack of professionalism. These problems are avoidable! I have over 25 years experience painting houses and commercial buildings. 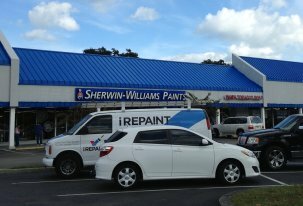 iREPAINT began in New Smyrna Beach painting houses in 2003 and today we service all of Volusia County. We are a independently owned business specializing in top notch craftsmanship for those who understand value over price. Why you should look for value over price? Many consumers are not sure what things to consider when choosing the right painting contractor. Often low price is the main factor considered when choosing a painter, but what other things need to be considered? When you are in need of a professional painting contractor you must look for certain clues to help you in your decision making process. Often quotes given by shoddy craftsman stand out because they don't abide by local rules and regulations. Unlicensed and uninsured they put their customers in harms way. It is essential that a professional business has a license and insurance to conduct business in an honest, safe and ethical fashion. iREPAINT values our clients and protects them, their homes and belongings by carrying the required licenses and insurences. Knowledge and experience require patience and practice. We have 25 years of experience applying paints and coatings. I have been painting and managing painting projects for more than half of my life and I intend on continuing to provide the best quality and service in Volusia County for many more. I urge you to call me to schedule your free estimate today. Pressure Washing, Power Washing or Water blasting; We have the experience and knowledge to pressure wash any surface you desire. We always use a soap and chlorine mixture to remove and kill mold, mildew and algae. 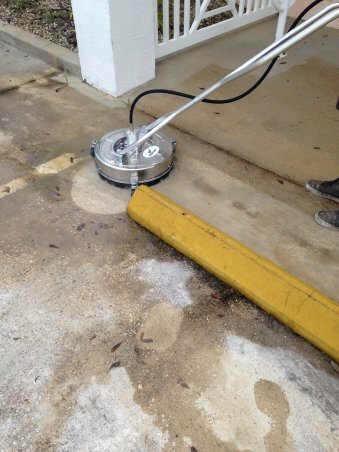 We also will perform Hydro Scrubbing to you driveway, patios and walkways. We have extensive experience in chemical roof cleaning. Exterior Painting; Your homes first barrier of defense against mother nature is a quality paint job. Therefore it is the painters job to ensure your coating has the correct thickness to withstand the elements and be free from unsightly blemishes. From 100% Acrylic Paint to elastomeric waterproofing. We know how to do it all! Interior Painting; We apply our paint to achieve beautiful finishes. A freshly painted room can change the entire character of your home. Choosing the right paint is easy for a seasoned pro, knowing when to use alkyd based paints or latex paints can be confusing and lead to coating failures. Irepaint professionals never skip steps to ensure a lasting finish. Deck Staining; As painting professionals we have extensive experience in staining wood docks, wood decks, wood fences, wood siding and all other wood surfaces. You choose if you want a solid stain, a semi-transparent stain or a basic clear wood sealer. We even can treat your more exotic woods like teak or ipe'. Roof coatings; we have extensive experience in both painting roofs for aesthetics and applying elastomeric roof systems for older, troubled or leaking roofs. We are on the cutting edge of this industry and have applied many different fluid applied roofing systems from Kool Seal, Karnak, Sikaflex, Tropical Coatings and Johns Manville. Sheetrock repairs; we can remove and replace loose drywall tape, Orange Peel texture Patches, knock down texture repairs and splatter texture repairs. Gutter Cleaning; if you need to have your gutters cleaned out our pro's are trained on ladder safety and can knock this task off the "Honey Do" list. Grass Painting; when you need your lawn to look great fast the only thing to do is use a specialty paint to green up your yard and make it look healthy. This is a great solution for golf courses or houses in need of a quick sale. Specialty Caulking; we have experience with solvent based caulking or urethane caulks. Cabinet Staining and Cabinet Painting; We use HVLP fine finish spray equipment to give you a beautiful and durable finish for both old and new cabinets. Wallpaper removal; we have the experience and ability to strip wallpaper, vinyl wall coverings, fabric wallcovering and Grass cloth. Garage Floor Coatings; preparation is the key to a lasting garage floor coating. We often acid etch and mechanically abrade floors for a lasting finish. Driveway Coatings; Staining a driveway is a great way to freshen up your homes curb appeal and add a layer of protection to your driveway. We have the skills, knowledge and experience to paint any surface! We are Volusia County's Finest Painting Contractor. Call 386-416-8861 For Your Free Estimate. iREPAINT.com has a portfolio that we are proud to tout. We have 25 years of experience and a wide range of services. Port Orange Paint Business Customer Review 5-2015!! Deltona Painter Review. iREPAINT Gets Rave Review For Going The Extra Mile! Port Orange Painting Company Review! Port Orange Painting Company is Highly Recommended! Port Orange Painter Review Posted on HomeAdvisor 5-3-2015! Edgewater Painter Hits Another HOMERUN! Edgewater Painter gets rave review, Check it out for yourself! Edgewater Housepainter Gets Another 5 Star Review! If you are looking for the best Edgewater housepainter, then this is the place for you! Another 5 Start Review Posted For "Debary Housepainter"
Debary Housepainter gives another 5 star performance! Are You Looking For a Daytona Beach Painting Contractor? Daytona Beach Painting Contractor, iREPAINT is Volusia County's Finest Painting Comapany! Are You Looking For a Holly Hill Painting Contractor? Holly Hill Painting Contractor, iREPAINT is Volusia County's Finest Painting and Powerwashing Business! Are You Looking For a Ormond Beach Painting Contractor? Ormond Beach Painting Contractor, iREPAINT is Volusia County's Finest Painting Comapany! Are You Looking For a Pierson Beach Painting Contractor? Pierson Painting Contractor, iREPAINT is Volusia County's Finest Painting Comapany! Are You Looking For a South Daytona Painting Contractor? South Daytona Painting Contractor, iREPAINT is Volusia County's Finest Painting Comapany! Are you looking for a Port Orange Paint Business to trust on your upcoming Paint job! Are You Looking For a Ponce Inlet Painting Contractor? Ponce Inlet Painting Contractor, iREPAINT is Volusia County's Finest Painting Comapany! If you are looking for the best New Smyrna Beach Painting Business? Look no further you have come to the right place! If you looking for a Edgewater Painting Contractor, give iREPAINT.com a call for a free estimate. We are Volusia COunty's Finest Painitng Contractor. 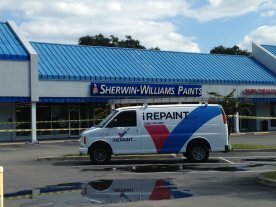 If you are looking for a Deland Paint Business who is licensed and insured, you are in the right place! Are You Looking For a Deleon Springs Painting Contractor? Deleon Springs Painting Contractor, iREPAINT is Volusia County's Finest Painting and Power Washing Business! Are You Looking For a Deltona Painting Contractor? Deltona Painting Contractor, iREPAINT is Volusia County's Finest Painting and Powerwashing Business! Are You Looking For a Lake Helen Painting Contractor? Lake Helen Painting Contractor, iREPAINT is Volusia County's Finest Painting and Powerwashing Business! Are You Looking For a Orange City Painting Contractor? Orange City Painting Contractor, iREPAINT is Volusia County's Finest Painting and Powerwashing Business! Volusia Counties Best Exterior Painting Contractor! Why Pressure Washing is the most effective way to clean outdoor surfaces. Pressure washing is the most effective way to clean outdoor surfaces. With the proper equipment you can clean anything from your driveway to your roof. 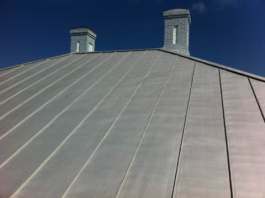 A Roof Coating System is a economical solution for troubled metal roofs. Paint removal requires years of knowledge and experience to achieve professional results. Are you in need of someone for your gutter cleaining project? iREPAINT professionals are trained in ladder safety and can help you knock this task off of your "Honey Do List"
Are You Thinking About that Driveway Painting Project? Are You Thinking About that Driveway Painting Project? Then this is the page to learn how to paint your driveway! Volusia Counties Best Interior Painting Contractor! Drywall repair of holes and how to blend your patch! Why Would You Choose To Use Alkyd Paint? When and where to use Alkyd Paint. Are You Lead Safe, if your home was build before 12-31-1977 the EPA has deemed your house a potential lead hazard. iREPAINT reviews specialty paints to give you some ideas on how to freshen up your home or jazz up your crafts. Rust-Oleum Mirror Effect Paint, Mirror Effect is an innovative coating that transforms glass and acrylic glass into a unique mirror finish. Why Choosing A Quality Paint Brush Makes A Huge Difference!